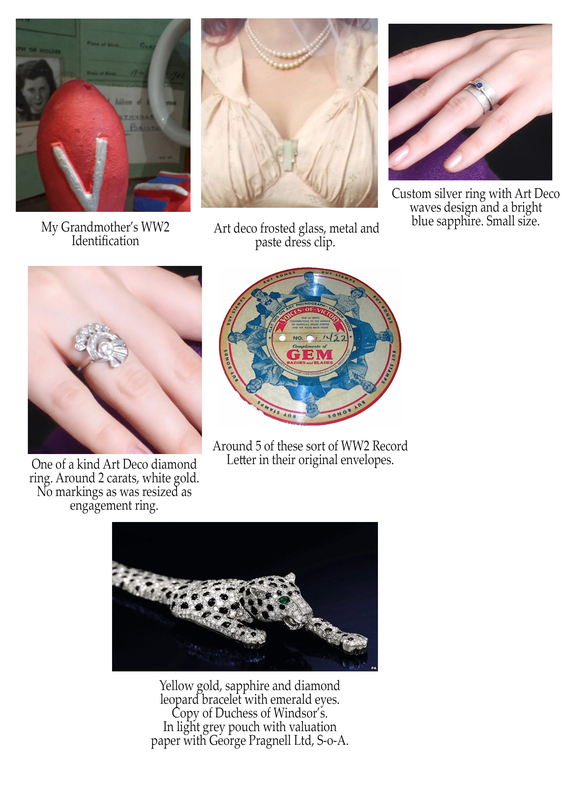 About an hour after the 2 minute silence on Armistice Day (11th November 2014), a man broke into my home and stole selective pieces from my WW2 collection, nearly all my vintage jewellery, my silver wedding purse, ww2 leaflets, WW2 letter records (the type you play on a record player), a panther/ leopard bracelet based on the Duchess of Windsor’s, ww2 pamphlets, pocket watches, vintage watches, cufflinks, tiebars and even my Grandmother’s WW2 Identification Card. They stole a Nikon D70s camera with a DX lens along with memory cards (holding photos for a future article as well as other things) and my back up drive housing all my photos and videos. They also broke into my next door neighbours house and as well as jewellery and the like stole his Saxophone?! We have 1 possible sighting and that was of a man holding a large box of stuff with a large scary dog. He was stood opposite the Lower Compton turning on King’s Lane, Stratford upon Avon. I have lost all of my Grandmother’s jewellery, all I have left is her lace handkerchief. 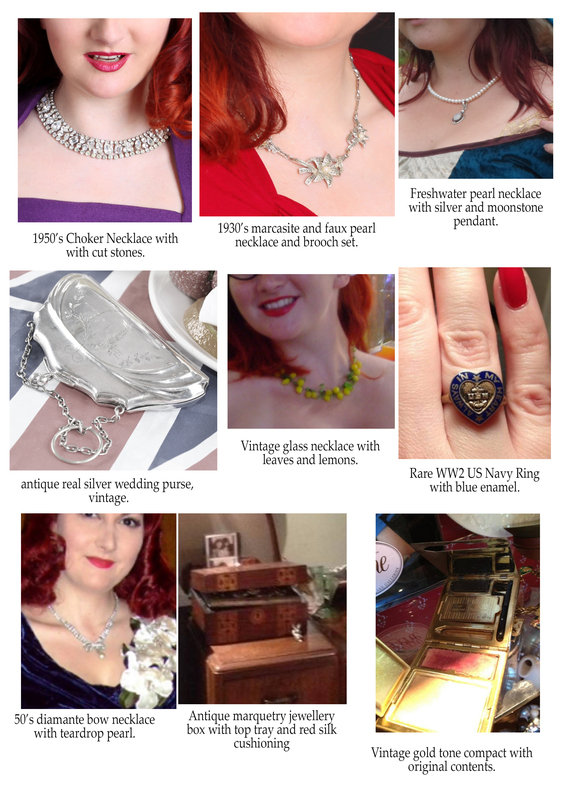 I have lost my Art Deco engagement ring, all the vintage jewellery I have collected over the years at shows, my torpedo necklace and earring, compacts, and even a Bundles for Britain charm bracelet which was a treasured gift. I cannot tell you how it feel to walk into your home, knowing someone had been in there. The sudden gust of cold air coming from an unseen broken window and the crackle of glass underfoot as you scan the room. This guy had carefully selected pieces from my cabinet and even closed the door again. This is not an easy cabinet to get into and you don’t just push it gently shut. He had been less careful in the bedroom with all cupboards and drawers opened, bags ripped open (one gas mask bag lock had been torn in his haste to check the contents). The thief shook out my military burlesque costumes out of my WW2 kit bag to put his loot in (if you spot this, it has white stenciled writing on it, an address for an American College) before going next door. I am still so shaken, I can’t think straight, I can’t sleep right and I want to stay hopeful and proactive enough to track down at least 1 of these things that may give us a lead. This was a professional job and he knew what he was taking. 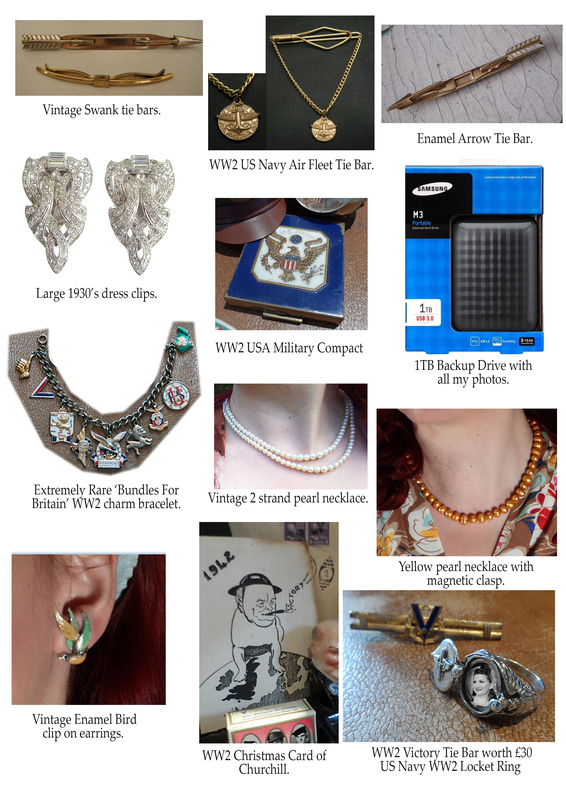 Some of these items, especially my engagement ring, leopard bracelet and charm bracelet are so unique and rare that these should stand out. Please help us catch these crooks? So I am calling on you antiques dealers, militaria collectors and dealers, carbooters, followers, friends, anyone out there who can help. We will be doing local searches and internet searches, but it is going to take far more than that to hunt a piece down I am sure of it. Below are some images of just a few things that were taken. 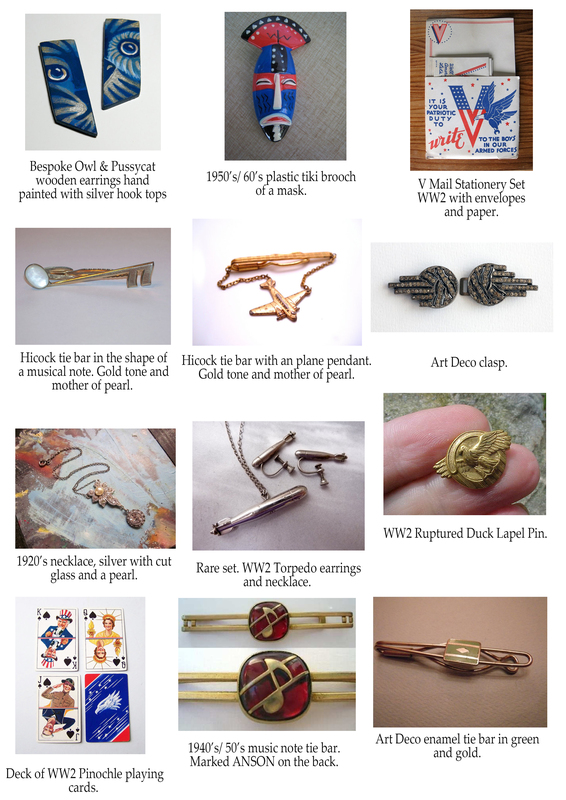 If you can print them off and carry them around with you when you go to your next antiques centre, or keep your phone handy to check the photos at a militaria show then that would be fantastic. Don’t worry about searching for the Tiki Mask Brooch, he dropped that. Notify the police immediately if you see anything. My crime incident number is Kitten 23S6/25722H/14. Or you can say it is regarding the Von Mew Burglary in Stratford upon Avon on 11th Nov.
Posted in Day to Day and tagged 1940's jewellery, 1940's necklace, art deco diamond ring, art deco jewellery, art deco ring, bomb necklace, break in, burglary, burgled, gem blades record, kitten von mew, leopard bracelet, military jewellery, stolen jewellery, sweetheart ring, torpedo necklace, ww2 charm bracelet, ww2 cufflinks, ww2 jewellery, ww2 necklace, ww2 record letter, ww2 tiebar. Bookmark the permalink.